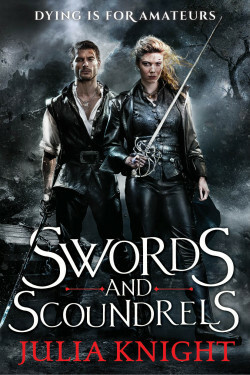 My latest series (beginning with Swords and Scoundrels) deals with a brother and sister who are best frenemies. And when I was asked to write this post Erin said “Why siblings?” I had to stop and think. “Because it seemed like a good idea at the time” probably wouldn’t cut it! But then I thought back and, well, there were reasons, even if they weren’t conscious at the time. The book starts with the statement “They say an ounce of blood is worth a pound of friendship”. And family is one of those things – even if you run away to the other side of the world, they are still a part of you. Shared memories, why you distrust men whose eyebrows meet in the middle, why you think X about Y, all these and many more are all bound up in you, from your family when you were growing up. It doesn’t even matter whether you like your family or not, you’re stuck with them, even when you’re a thousand miles away. But often – not always but often – even if you don’t like them, you do grudgingly love them. You can call your mother/brother/uncle that scum-sucking bleep, but woe betide anyone else who dares to. The people who were around when you were growing up are the bones of your view of the world. Of course siblings can have a particularly complex relationship. Brothers who are friends and rivals by turn. Sisters who spent their teens giggling over boys together who then compete for the best behaved children or the most glittering career. Most children who have siblings compete for their parents’ approval in one way or another, and that doesn’t stop when we grow up. And that’s in normal families. If you add in some disfunction…. Add in the clashing personalities that are a feature of some families, the sense of duty towards someone who is your polar opposite, resentment that you seem to be lumbered with them no matter what…. Given all that juicy conflict and mixed emotions the question is why not siblings?